As cities become denser and buildings taller, we are seeing more gardens being grown vertically. But vertical gardens – which include green walls, facades and free-standing structures – are not actually a new concept. Historical accounts show that the Romans grew grapevines and climbing roses on trellises and walls. Many people will also be aware of the Hanging Gardens of Babylon – one of the seven wonders of the ancient world. Vertical gardens continue to evolve today. Here’s a more recent history. 1938 – Landscape architect Stanley Hart White created and patented the modern garden wall, which he called “Botanical Bricks”. 1980s – French botanist Patrick Blanc popularised and modernised the vertical garden concept. 1988 – the use of stainless steel cables for vertical gardens was introduced. 1994 – there was the first major application of a trellis system at the Universal City Walk in California. The installation uses a trellis comprised of modular panels. 2002 – MFO Park in Zurich was built. 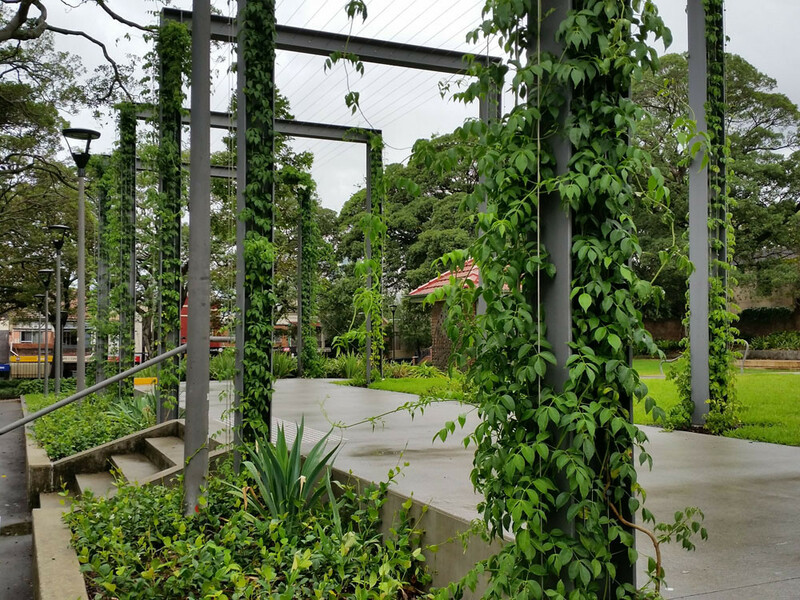 This vertical garden – 17m high, 35m wide and 100m long – consists of a trellis made from Jakob cables and fittings which is covered with climbing plants. The garden also has sundecks and platforms accessible by stairs, and has won numerous awards. 2005 – The ‘Bio Lung’ became the centrepiece for the Expo in Aichi, Japan. The plant-filled vertical wall showcases how a lush garden can be created even in very densely populated areas. 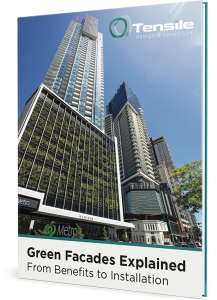 2013 – Patrick Blanc designed the vertical garden for One Central Park Sydney – a project Tensile is proud to have been a part of. The building’s green facade consists of 2,500 hydroponically-fed climbing plants and 15kms of stainless steel cables. Vertical gardens continue to evolve and grow in popularity. Their capacity to absorb pollutants and improve air quality means they are becoming a serious solution for improving public health and building performance. However, it’s essential that vertical gardens are well-designed and maintained so that they perform as intended and have longevity. At Tensile, we believe all vertical gardens should begin with good design! Get in touch with us if you have a project concept you would like to discuss.